This project identified and highlighted lessons learned and promising practices in the area of government-led wireless networks, with a special emphasis on Digital Inclusion. The project findings and analysis are helping local governments, community representatives and industry plan, develop, and implement the most effective, inclusive, and sustainable wireless networks as part of their broadband deployment plans. Funded by the California Emerging Technology Fund (CETF) and implemented by Community Partners, the California Community Technology Policy Group (CCTPG), the BroadBand Institute of California (BBIC), and CETF, the project findings and analysis are presented in the Summary Report Wired for Wireless? 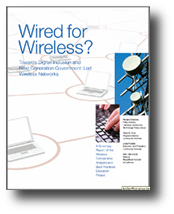 Towards Digital Inclusion and Next Generation Government-Led Wireless Networks. Community, government, and industry stakeholders are invited to use these documents to further application and advancement towards the greater goal of Digital Inclusion. The checklist is intended for representatives of community and local governments interested in implementing a government-led wireless network.